Esseborne Manor is a small and charming, family-run property with the feel of a private home. It is set amidst the splendour of the North Wessex Downs in an area of outstanding natural beauty. Highclere Castle and Windsor are both nearby. Our members can enjoy tea and scones on arrival and dinner on their first night at the award winning Courtyard Restaurant. Just for you: 1 x complimentary golf session at Hampshire Golf Club. Located close to Highclere Castle, home of the television series Downton Abbey, this family run Victorian Country Hotel is small and unpretentious. It is set amidst the splendour of the North Wessex Down, close by the lovely Bourne Valley, in an area designated one of outstanding natural beauty. There is plenty to see and do in the area! 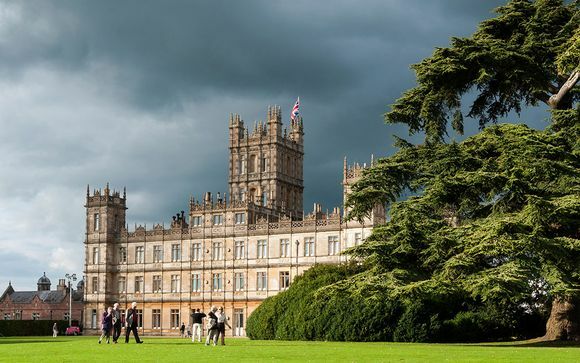 Highclere Castle. Home of Earl and Countess of Carnavon and the television series Downton Abbey, this is the ultimate in high Victorian Exuberance. Open on various dates between Easter to September. Mottisfont Gardens. A National Trust House surrounded by glorious gardens bordered by an almost magical stream running past towering ornamental trees. Houghton Lodge Gardens. One of the most beautiful privately owned houses and gardens with fine trees and lawns sweeping down to the banks of the River Test. Hillier Gardens. 160 acres of gardens with 36000 plants originating from every continent. Wilton House. Just 6 miles from Salisbury is the 16th Century home of Earl of Pembroke with its 17th century interiors, a world famous art collection and sculpture gallery. 22 acres of gardens are perfect for visitors to explore or relax in. The house, which for over 100 years has been a country retreat, still retains the feel of a private home where the Hamilton family provide a warm and caring welcome. Expect comfortable rooms and cosy lounges, with bedrooms that offer fluffy towels, locally filtered water and homemade biscuits. All rooms are individually decorated and boast a cosy atmosphere and pretty furnishings. The restaurant serves award-winning cuisine in an elegant setting, whilst the bar has a fine selection of wines, malts, spirits, liqueurs and draught bitter. The bright and airy lounge is ideal for relaxing in with an after-dinner drink, a selection of magazines and newspapers are available for your enjoyment. All of the bedrooms overlook the gardens and are decorated individually to provide a lovely environment with a unique feel and atmosphere. Deluxe bedrooms have in-bath showers, comfortable sofas and many have king-size beds. The Madingley Room has vhandeliers and a silk draped four-poster bed. 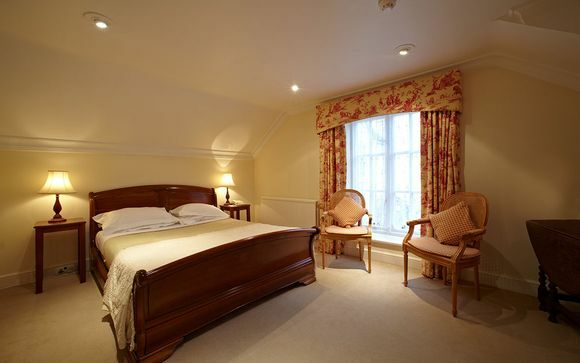 The Lymington Room has a luxurious Victorian Slipper Bath with a separate walk-in shower! The award winning Courtyard Restaurant offers a choice of menus in an elegant dining room overlooking the gardens and farmland beyond. All dishes are freshly prepared by Head Chef Dennis and his team, with herbs from the hotel Herb Garden and extensive use of local Hampshire and Berkshire produce. The competitively priced weekday lunch menu includes a choice of dishes with a glass of wine, while on Sundays there is the ever popular Sunday Buffet Lunch. Traditional English Afternoon Tea is becoming very popular with an extensive selection of teas, a selection of finger sandwiches, cakes and scones with jam and clotted cream, plus the option to add a glass of champagne for that special celebration! Dining at Esseborne is a real treat with pre-dinner drinks and canapés in the bar or on the patio, a meal in the elegant dining room accompanied by freshly baked home made bread and a fine selection of wines, all finished off with coffee and petit fours in the lounge. Exit at Junction 8 and take the A303, then onto the A3093 to Andover. At the Tesco Roundabout just before entering Andover Town take the 3rd exit signposted Newbury A343. Hotel is 7 miles down this road (1 mile north of Hurstbourne Tarrant) on the right. Exit at Junction 9, taking the A34 past Oxford and onto Newbury. Then follow the directions as per M4 below. Exit at junction 13 turning left onto the A34 to Newbury then continue on the A34 past Newbury. Turn off onto the A343, signposted Highclere. Turn right through Highclere and we are 7 miles down the road on the left. Take either Waterloo to Andover or Paddington to Newbury. Transport can be arranged to collect you from either station.